Match these enticing headlines with a powerful background image, and you've got a match made in heaven for driving traffic (and potential clients) to your website. All you need to add is the most powerful social media platform that sends traffic, leads, and paying clients your way while you sleep. Sound too good to be true? Let me introduce you to the power of PINTEREST. Today we're going to look at one of the most important components of any Pinterest strategy - creating powerful Pins that are primed to go viral for your own website content. There is a formula for creating a powerful Pinterest pin, and the good news is that you don't need expensive design software to do it. I'm going to teach you step-by-step how to use Canva, a free online design program, that is perfect for creating all of your Pinterest images. And according to Canva themself ... this tutorial pretty much rocks! Just like anything worth doing in business, you can't just throw together a Pinterest account and hope that it magically drives traffic for you. It takes an intentional strategy and some advance planning to make Pinterest work. If you're intrigued and want to know more, be sure to sign up for my FREE 5 Day PINTEREST POWER E-Course. It's the ultimate guide to getting traffic, leads + paying clients from Pinterest! If you haven't ever used Canva before, go ahead and go to Canva.com, where you can go through the steps of creating an account. Or login to your current Canva account. 1. At the top of your account, you'll see the following choices when deciding what kind of design you'd like to create. None of these are a perfectly optimized size for Pinterest, so click the + sign that says "More..."
You'll then see a full page of image size choices, and you'll see under the heading Social Media Posts, the choice for a Pinterest Graphic. This is a 735 x 1102 px image, which is the optimal size for Pinterest. Click on this choice to get started designing. You now have a completely blank Pinterest image canvas ready for creation! We'll get started by inserting a photograph as the background to your image. We'll be using one of the free photos that can be found in Canva to keep things simple, but you can also use your own photo or a color background. 1. On the left navigation bar, click the BKGROUND option. Then click in the search bar area where it says "Search 1,000,000 images ...."
2. Once you click in the search bar, you'll see the following options show up. Click on the option "Photos." 3. You'll now see multiple photos labeled FREE that can be used in your image for no charge. Choose one that you like, and drag and drop it into your blank canvas. After dropping the image on your canvas, you'll need to click and drag on the circles found on the image corners to increase the size of the image so that it covers the entire background of the Pin. 1. Now it's time to add a powerful headline to your image. Go back to the navigation bar on the left and click on the "TEXT" option. 2. Click on the "Add heading" option, and a text box will be inserted as the top layer of your image. 3. You have several choices to make about your font. Be sure to choose a font that is bold, and easy to read. Most Pinterest users are on a mobile device, so it's very important to chose a font keeping mobile users in mind. 4. It is also time to choose the size of your font and the color. Choose a color that contrasts with the photograph for ease of readability, and a font size that is large enough to read on the smaller pins that show up on mobile Pinterest. 5. Once you've made choices about the font, size, and color, you'll brainstorm your enticing headline. Here's a great infographic from Twelveskip.com that gives you 100 powerful headline templates to get you started. Click on the image to access the full article. 6. If you want to do more advanced editing to your text, click on the small arrow to see more options like text spacing, centering, and bold/italic options. You can also resize your text box by dragging the small circle in the corner of the box, similar to how you resized your background image. 1. For some images, this may be all that needs to be done. However, often your text is not going to stand out well enough if your background image is similar to the one that I used in the example. In this case, one option is to add a semi-transparent box behind the text to make it contrast better against the photograph. Luckily, Canva makes this quite easy to do! 2. To add a semi-transparent box behind the text, start by click on "BKGROUND" in the navigation bar on the left. Then click in the search bar at the top where it says "Search 1,000,000 images ...". Then click the option that says "Shapes,c and click on the gray square shape to insert in onto your pin. (The reason to choose the gray square is because it is already set to semi-transparency. We can easily change the color once it is inserted into the image). 3. Use the small circles on the corners of the inserted gray square to resize the shape to nice fit around the text overlay. Important: The semi-transparent box is currently the top "layer" of the image. You need to send it "back" one layer so that it is behind the text overlay. Do this by clicking the "Back" button when the box is selected. 4. Now its time to decide if you like the current color of the semi-transparent box, or if you want to change it. You can always play around with it to see how different colors look. 1. Click the color circle. 2. 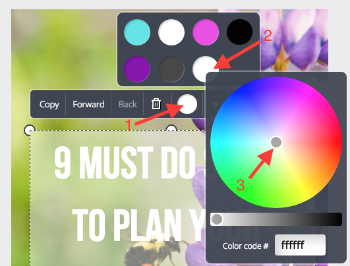 Choose one of the pre-selected colors or click the + sign to bring up a full color wheel. 3. Choose a specific color by clicking on the color wheel or entering a color code #. 5. You have now created your first Pin-Worthy Pinterest Image! There are of course more advanced techniques that can be applied, such using more than one font or adding a small logo. But for now, you have a high quality image that can easily be edited and tweaked to fit any website content. The final step is to download your image. 1. At the top of your screen, click the "Download" button. 2. Choose either a JPG or PNG download. PNG is a higher quality image, but JPG will improve your website loading speed for larger images. 3. Once you're made your choice, the image will automatically download to your computer. This pin you just made will also automatically save in your Canva account. That means the next time that you are ready to create another Pin-Worthy image, you'll already have a pin template ready to go. Just switch out the photograph, change the text wording, maybe change a few colors, and you're all set! Don't let this Canva tutorial go to waste. I know how easy it can be to read something and think - Wow! This is exactly what I need, and I totally can do this! Then life gets in the way, and you end up letting that stroke of inspiration slip away. If you have never created a Pinterest image before, take action now. This shouldn't take any more than 15 minutes, and I'm right here ready to respond to comments below if you have any questions. If this is your first time creating a Pinterest pin, post a link to your image in the comments below once you've pinned it to Pinterest, and we'll be sure to send a little re-pinning love your way! FREE Pinterest Course: The Ultimate Guide to Building a List, Capturing Leads, and Securing Paying Clients with Pinterest!